Karina era sencillamente la niña masbella del mundo, quien no canto esa de la Pluma de un Angel . Por lo visto tú no la cantaste, porque de lo contrario sabrías que se llama “La noche es mágica”. Tenía esecassete como a los 7 años, sólo para escuchar la canción de Karina jaja. Ladillaba burda a mis papás pa que retrocedieran la cinta y la escuché como mil veces. Alguna persona sabe donde y como conseguir las canciones de “CORRE LA VOZ” agradezco si alguien me lo informa. Hola Rosa… Hoy en dia existen muchos buscadores para bajar canciones por internet, si conoces a alguien que sepa de computacion dile que te los baje como Mp3, por el momento solo te puedo dar en la pagina web http://www.salvavinilos.com/?p=153. aqui solo podras escuchar las canciones del album. Karina siempre bella y talentosa. Fuiste mi novia en la adolescencia, estaba locamente enamorado de ti, ademas de que aprecie mucho tu gran talento que aun hoy mantienes junto a tu hermosura. Dios te bendiga y sigue adelante, todavia tienes mucho que dar a tus fans. quien me dice como o donde puedo descargar la musica de karina Amor a millon. :lol:que bellos recuerdos yo apenas tenia 8 años y fue muy emotivo para mi. Este disco fue una super produccion de varios artistas invitados, y especialmente con Karina, que hoy en dia se a mantenido en el gusto del publico y ahora en este mes de febrero lanzara su 8va produccion discografica llamada DE DIE, y su sencillo promocional SI PUDIERA que esta sonando en las diversas radio de venezuela..
Recuerdo el especial de “Corre la voz” el lema de este disco era: “Navidad con los lideres,” los lideres eran por supuesto los cantantes que grabaron el disco eran aparte de Karina: Mirtha Pérez, Ricardo Montaner, Melissa, Guillermo Carrasco, Mirla Castellanos, José Antonio García. 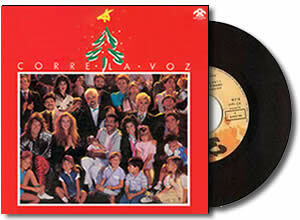 Otra de las canciones del disco era el “Tamborilero” interpretada por Ricardo Montaner, “Noche de paz” interpretada a duo por Melissa y Guillermo Carrasco, “Niño Lindo” interpretada por Mirtha Pérez. Por cierto tambíen participaba Paul Guilman no recuerdo que cantaba ni se que hacia ahí. Mi canción favorita era “Este es el tiempo” interpretada por todos los cantantes participantes. This post seems to get a large ammount of visitors. How do you advertise it? It offers a nice unique twist on things. I guess having something real or substantial to give info on is the most important factor. This domain appears to recieve a good ammount of visitors. How do you get traffic to it? It offers a nice individual twist on things. I guess having something useful or substantial to talk about is the most important thing. I admire the useful info you provide in your content articles. I’ll bookmark your blog and have my kids check up here generally. I’m very certain they’ll learn a lot of new things right here than anyone else! Terrific job here. I seriously enjoyed what you had to say. Keep going because you definitely bring a new voice to this topic. Not many people would say what youve said and still make it interesting. Properly, at least Im interested. Cant wait to see far more of this from you. Congratulations on having one of the most sophisticated blogs Ive come across in some time! Its just incredible how substantially you can take away from a little something simply because of how visually beautiful it is. Youve put together a good blog space –great graphics, videos, layout. This is definitely a must-see blog! Good to become browsing your blog again, it continues to be months for me. Nicely this post that i’ve been waited for so lengthy. I need this write-up to total my assignment in the university, and it has exact same topic together with your write-up. Thanks, great share. Congratulations on having one of the most sophisticated blogs Ive come throughout in some time! Its just incredible how very much you can take away from something simply because of how visually beautiful it is. Youve put collectively a wonderful blog space –great graphics, videos, layout. This is surely a must-see blog! Hey – nice blog, just looking around some blogs, seems a quite nice platform you’re utilizing. I’m presently using WordPress for several of my web sites but looking to change one of them about to a platform comparable to yours as a trial run. Anything in particular you’d suggest about it? I must say, as considerably as I enjoyed reading what you had to say, I couldnt help but lose interest after a while. Its as if you had a excellent grasp on the subject matter, but you forgot to include your readers. Perhaps you should think about this from far more than 1 angle. Or maybe you shouldnt generalise so much. Its better if you think about what others may have to say instead of just going for a gut reaction to the subject. Think about adjusting your own thought process and giving others who may read this the benefit of the doubt. Thank you for an additional terrific post. Exactly where else could anybody get that kind of details in such a perfect way of writing? I’ve a presentation next week, and I am on the look for this kind of facts. OMG! It’s like you read my mind! You seem to know a lot about this, like you wrote the book in it or something. I think that you could do with some pics to drive the content home a bit, besides that, this is wonderful blog. A wonderful read. I’ll definitely be back. Thank you for an additional fantastic post. Where else could anybody get that kind of data in this kind of a perfect way of writing? I’ve a presentation next week, and I’m on the look for such info. I must say, as much as I enjoyed reading what you had to say, I couldnt help but lose interest after a while. Its as if you had a terrific grasp around the subject matter, but you forgot to include your readers. Perhaps you should think about this from a lot more than 1 angle. Or maybe you shouldnt generalise so significantly. Its better if you think about what others may have to say instead of just going for a gut reaction to the topic. Think about adjusting your very own believed process and giving others who may read this the benefit of the doubt. Youre so right. Im there with you. Your weblog is definitely worth a read if anybody comes across it. Im lucky I did because now Ive acquired a whole new view of this. I didnt realise that this issue was so important and so universal. You certainly put it in perspective for me. Thanks so much for this! I havent been this thrilled by a blog for a long period of time! You have got it, whatever that means in blogging. Anyway, Youre definitely somebody that has something to say that people need to hear. Keep up the outstanding job. Keep on inspiring the people! I dig online games. Facebook games are fun a lot of the time. Sometimes they’re kinda boring. Please tell me that youre going to keep this up! Its so very good and so important. I cant wait to read extra from you. I just feel like you know so significantly and know how to make people listen to what you might have to say. This blog is just also cool to become missed. Wonderful things, really. Please, PLEASE keep it up! I think youve produced some genuinely interesting points. Not too many people would in fact think about this the way you just did. Im genuinely impressed that theres so substantially about this subject thats been uncovered and you did it so properly, with so a lot class. Beneficial 1 you, man! Really good things right here. Youre so right. Im there with you. Your weblog is certainly worth a read if anyone comes across it. Im lucky I did because now Ive received a whole new view of this. I didnt realise that this issue was so important and so universal. You certainly put it in perspective for me. I admire the useful data you offer in your content articles. I will bookmark your weblog and have my youngsters test up right here usually. I’m quite positive they will learn a lot of new things here than anybody else! I admire the useful information you provide inside your content articles. I will bookmark your weblog and have my youngsters check up right here typically. I’m fairly positive they’ll discover lots of new things here than anyone else! There is definitely a great deal to learn about this. In my opinion you made some really good points in Features also. delivers the reality of the matter. knowledge, i love to read opinions that educational worthwhile in nature. Thank you for that smart critique. Me & my neighbour were preparing to do some research about that. We got a very good book on that matter from our local library and most books exactly where not as influensive as your facts. I’m incredibly glad to see this kind of facts which I was searching for a lengthy time. I have read a couple of the articles on your blog now, and I truly like your style of blogging. I bookmarked it to my favorites web site list and will be checking back soon. Please visit my web site also and let me know your thought. Surprisingly! It’s like you understand my mind! You seem to know so much about this, just like you wrote the book in it or something. I think that you can do with some pics to drive the content home a bit, but other than that, this is informative blog. A good read. I will certainly be back. delivers the reality of the topic. knowledge, i really like finding articles that educational worthwhile anyway. gives you the reality of the matter. excellent, i really like finding thoughts that tell more of the story, they are more effective in nature. Hey, very nice website. I came across this on Yahoo, and I am really happy that I did. I will definately be returning here more regularly. Wish I could add to the conversation and bring a bit more to the table, but am just taking in as much info as I can at the moment. Damn, awesome site. I came across this on Bing, and I am extremely happy that I did. I will definately be returning here more often. Wish I could add to the post and bring a bit more to the table, but am just absorbing as much info as I can at the moment. Very efficiently written information. It will be helpful to anyone who usess it, including me. Keep doing what you are doing – for sure i will check out more posts. Not the fastest web site to load nonetheless I’m happy I waited. Having searched the majority of the morning for this kind of information I finally discovered it on your blog. One satisfied reader right here! Though this subject can be really touchy for most people, my opinion is that there has to be a middle or common ground that we all can uncover. I do value that youve added relevant and intelligent commentary the following although. Thank you! That was a interesting point of view. I’ll come back and see what else you are up to. Don’t forget this is the season for giving. Happy Holidays! Thanks for any other magnificent article. Where else could anyone get that kind of information in such an ideal approach of writing? I have a presentation subsequent week, and I am on the search for such info.